at The Pearl River Mart. 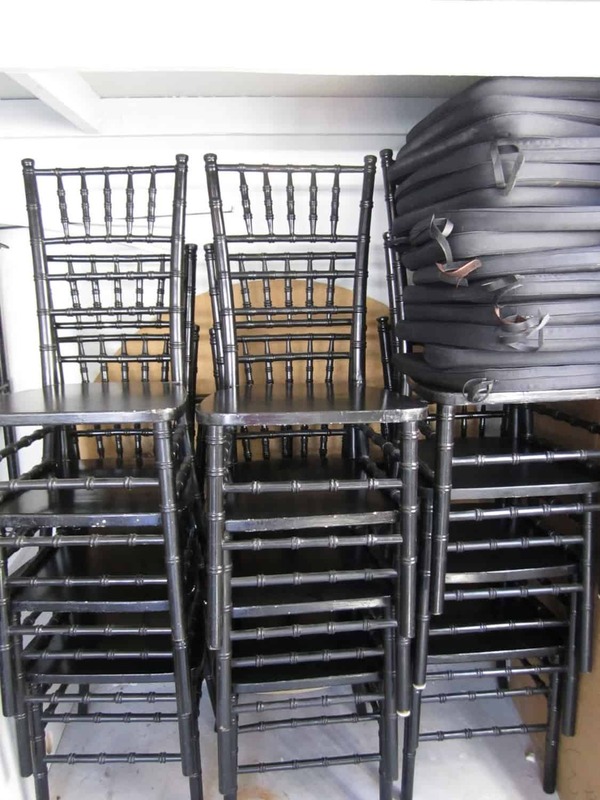 The stackable Chiavari chairs are reasonably priced when ten or more are purchased. all my friends/family are free to borrow them. 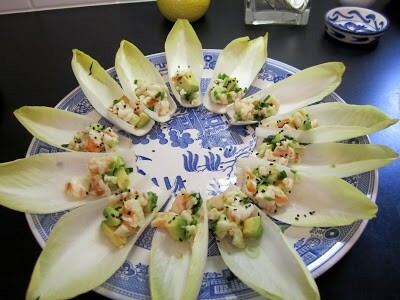 An appetizer of endive with avocado, shrimp. fresh lime juice and black sesame seeds. 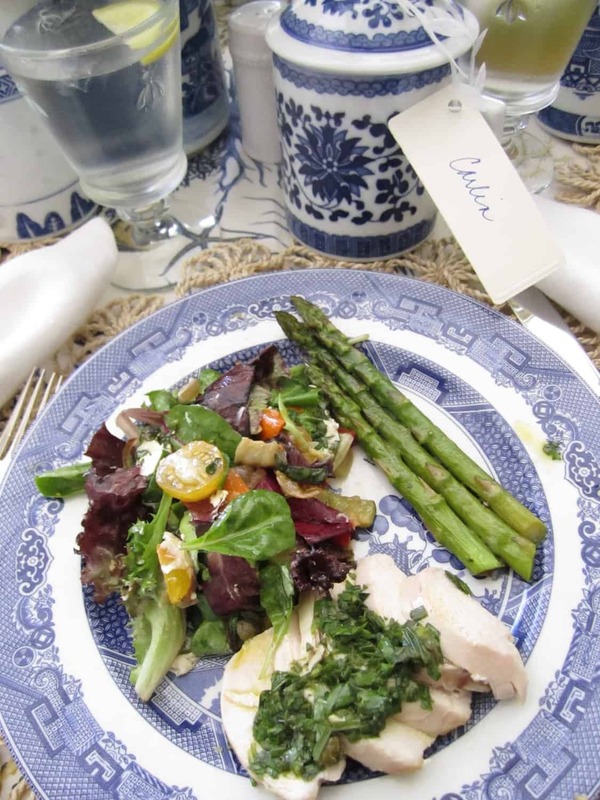 Grilled vegetables and tender chicken with an herb salsa and asparagus. 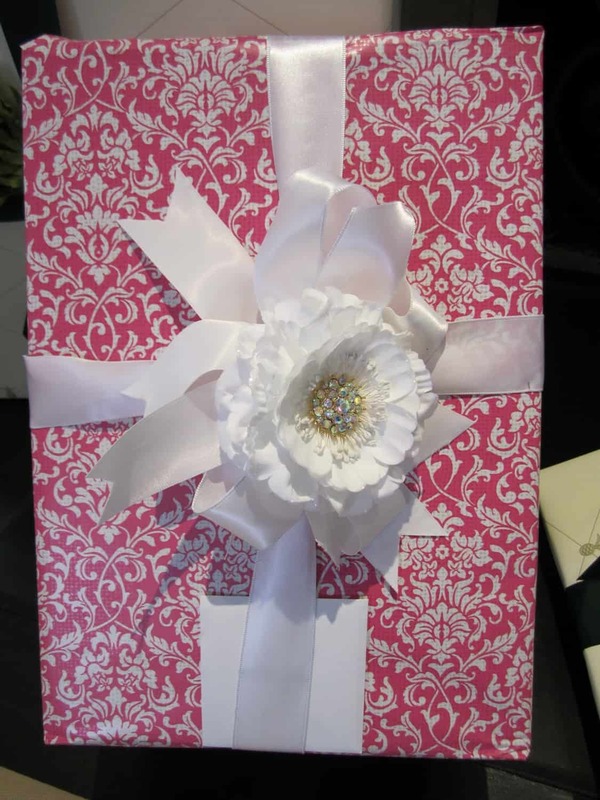 Claire always wraps presents beautifully. A rhinestone brooch garnishes a silk flower. Cheers! 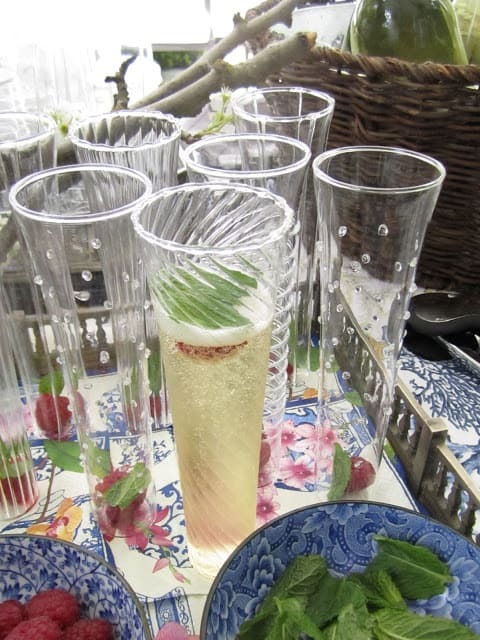 Champagne with raspberries and fresh mint. Thanks so much for joining us and for all your sweet comments. This is absolutely beautiful. I love the pale yellow and yellow green paired with the blue. Very elegant. This should be published! I LOVE it … the details are impeccable. Thanks for the resource on the chairs – you are right about them paying for themselves. FABULOUS!! Love every single thing including that last spectacular floral arrangement. 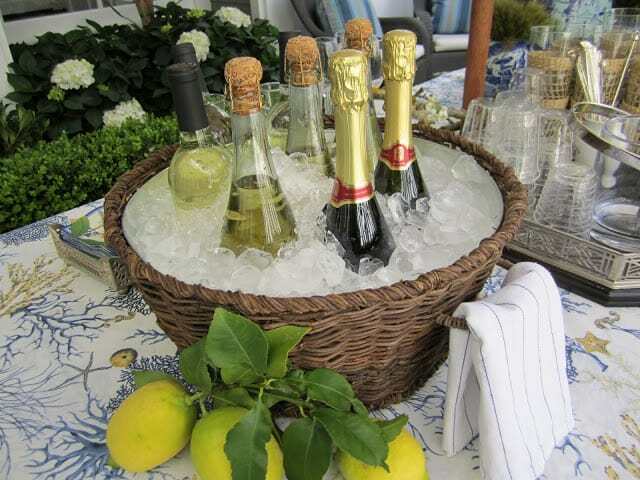 You neglected to mention where the wonderful woven baskets w/liners that you're using as coolers are from – I love those! Lovely. I adore seeing party-scapes and this one is to die for! Thanks for sharing the details! Those mugs were the perfect party favor! Who knew you could grab stacking banquet chairs for so little? What a wonderful shower. Loved everything about it. These pictures are stunning! I know the shower must have been a lovely event. 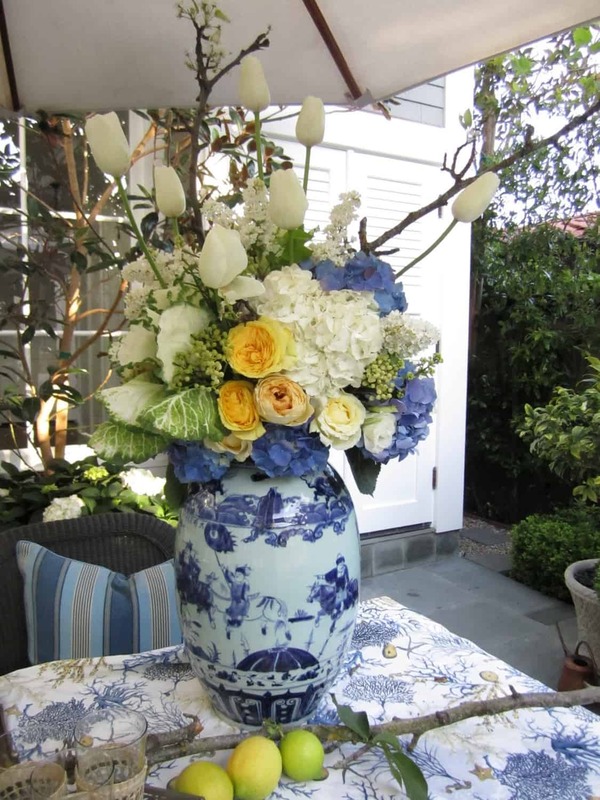 I particularly love the vase filled with the beautiful bouquet. Love seeing more from this shower. I agree with Sherri, it should be published!!! Elegance grandeur! 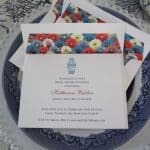 Love the theme, the blue is awesome & the florals exquisite. 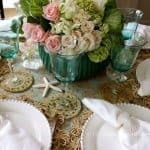 Just stumbled across your blog… and that table setting is immaculate! Such lovely dinnerware. 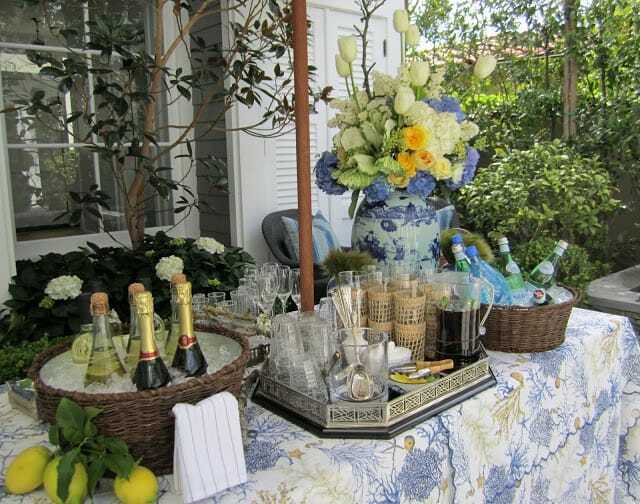 Might I say you KNOW how you throw a party..that table is just breathtaking!! Love the blue and white and the yellow was just the perfect accent and that flower arrangement..STUNNING!!!! Absolutely stunning!!!! Looks like a fun time was had by all..thanks so much for sharing. Loved it. The large flower arrangement is incredible. I love everything you did! The food and the table looks great, and the flowers are beautiful. Now, for my glass of champagne. How beautiful Mary Ann. Everything looks gorgeous and make that two glasses. One of the most elegant showers I have ever seen. Brilliant! What an absolutely gorgeous presentation. Unlike anything I've seen. 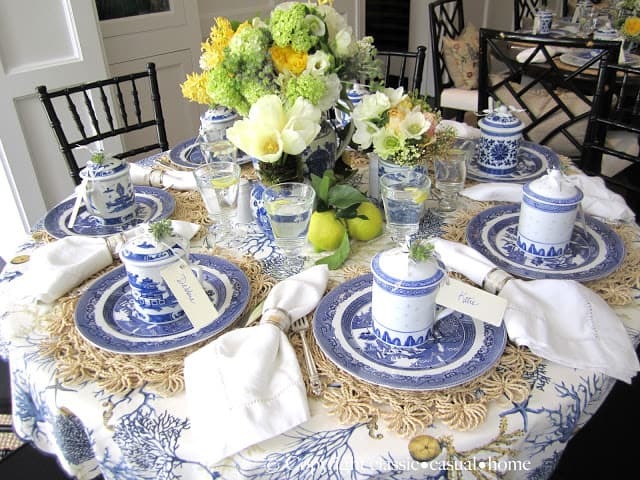 I LOVE the tabletop decor – especially the mugs with lids. And the champagne flutes are absolutely gorgeous. *** How many ways can you spell D*I*V*I*N*E P*E*R*F*E*C*T*I*O*N???? What a lucky, blessed & loved gal to have so many people do something so WONDERFUL such as this!!! 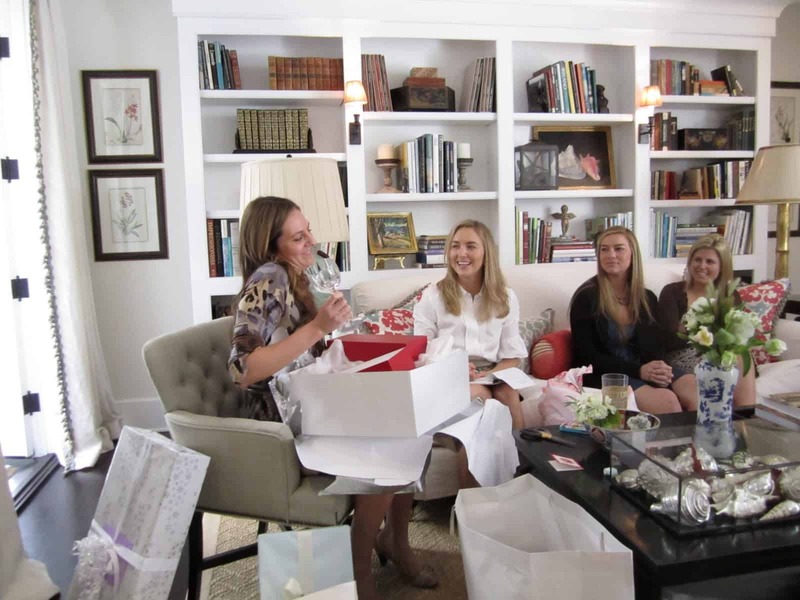 It makes my heart smile just to think about the Bride-to-be's reaction!!! How loving of you, and how truly BEAUTIFUL!!! Am so glad you shared this~~~ I DO hope it goes into a magazine, so OTHERS can pick up some pointers on how to make SOMEONE FEEL SOOOO TRULY SPECIAL and LOVED!!! It all looks beautiful. The food looks delicious too. What a great little party favor. Those mugs are so cute. I just love everything, Mary Ann. This was quite a shower worth remembering, all down to the last detail! Beautiful! What a great celebration and beautiful decorations enhance the happiness in the moment. Thanks for including us and sharing sources, photo's and a great event in a young-bride-to-be moments in the spotlight. Everything is exquisite great job. I want to get married again so you can give ME a shower. 🙂 what a beautiful day! These comments are making my day/week/month. I have to make sure Debbie and Laura read them, too (co-hosts). Thanks so much everyone. 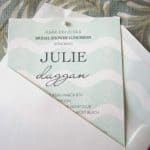 I don't think ANY bride has had a more thoughtful or beautiful shower … ever!! You all outdid yourselves on this one – the attention to detail and consistency of theme are amazing!! I think you all may need to start a new business as professional party planners!!! What a beautiful shower…the detail is amazing and those flowers are simple stunning. And of course the Blue Willow, my favorite. Gorgeous! I feel like I got a glimpse into Martha Stewart's house! Just lovely. That is such a beautifully planned gathering. Love the place settings! Thanks so much for stopping by my blog and leaving a sweet comment about my master bedroom reveal. I so appreciate it. Means a lot. Wow! This was one elegant and gorgeous shower. The bride is a lucky girl. I love your tip on the chairs. I'm making a mental note of that for the future. it is all just so pretty!!! what a great day! I am a new follower…thanks for the visit or I might not have found you! Charming and elegant, indeed! Not a detail missed. I have to go get those Bee goblets! what a gorgeous party…the blue willow ware is the perfect complement to all the pretty food and drinks…what a great idea to purchase those party chairs for all your entertaining…thanks for sharing at fridays unfolded! 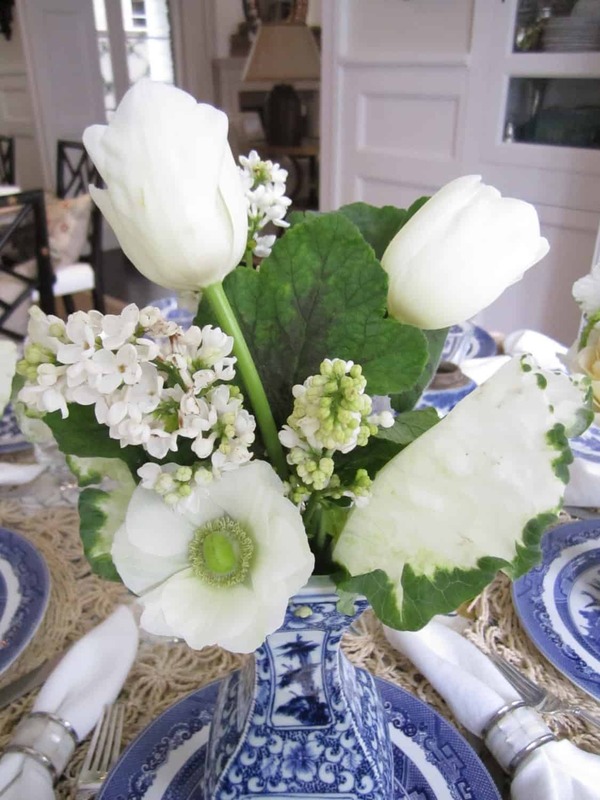 Thanks so much for following Town and Country Mom; if you hadn't I might not have found your beautiful blog so quickly! I'm so thankful it's Saturday morning because that means I have time to start at the beginning of your posts and read up to this beautiful party. 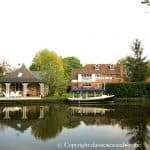 You had me at the first photo–absolutely lovely! Now you know how to plan a party!!!! Everything looked amazing from every angle and from every detail! I Love your blog. 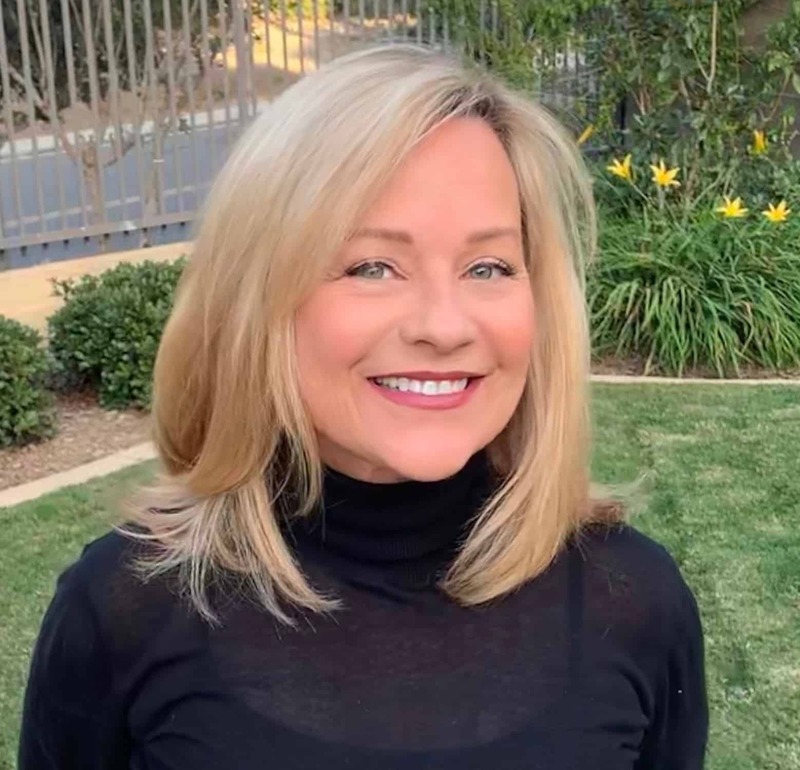 I have been "blog shopping" this week and I am excited to have found you! I am your newest follower and found you from Pink Saturday. LOVE.LOVE your shower. So creative and beautiful! Stunning! A lovely party. Why, oh why, does no one ever throw me a party like this? Beautiful settings! I love blue and white! Happy PS! 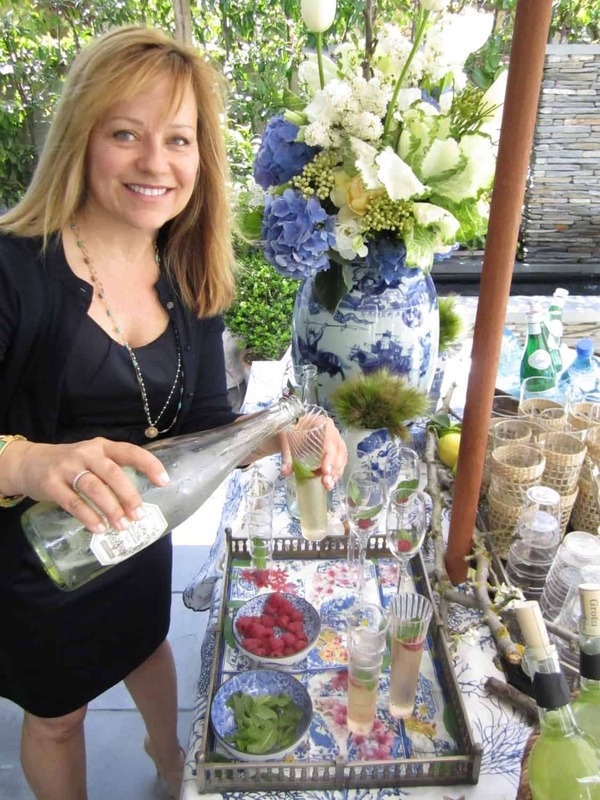 I'm freezing my $%# off here on the East Coast, and you are sitting outside drinking champagne. It's a really lovely party. I think I pinned every image including those bookcases. The blue and white collection is to die for. Really well done.